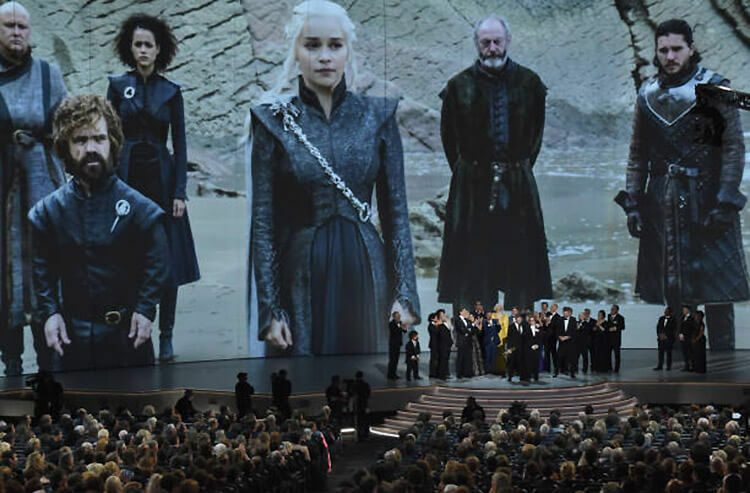 The 70th Emmy Awards display a clip from HBO's award-winning series "Game of Thrones"
Thankfully the winter season is coming to an end with spring just around the corner, but for fans of HBO's Game of Thrones "Winter is Coming." 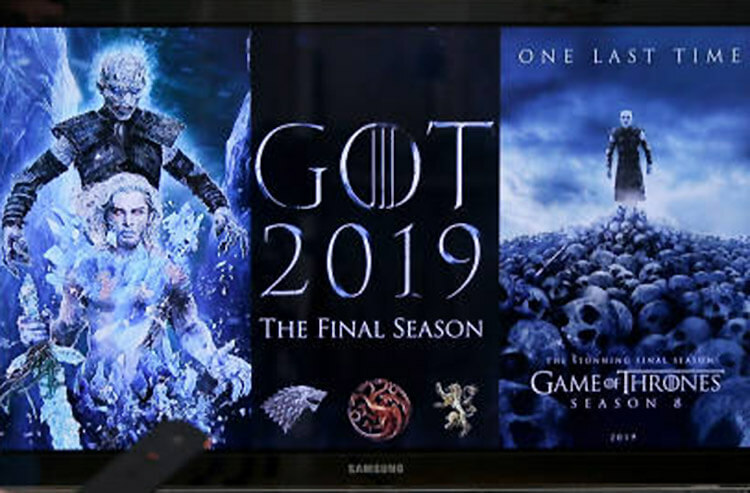 The eighth and final season of the award-winning series will premiere on April 14 and many fans are dying to know who will sit on the Iron Throne as the show draws towards its finale. Some sportsbooks are even taking bets on it. 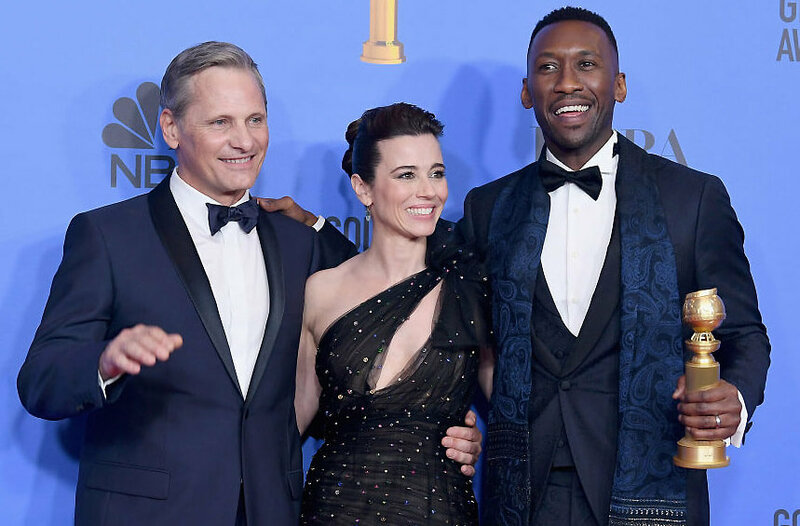 The Season 7 finale brought in an estimated 16.5 million viewers and that number could go even higher with this highly-anticipated season that has been two years in the making. We break down the odds and give you a fan analysis of how things might shake out in the Seven Kingdoms. Keep in mind that depending on your book, choices and odds can vary greatly for this sort of bet and the wording might differ as well. For example some books say "Who will rule Westeros at the end of Season 8?" while others specify "Who will sit on the Iron Throne?" Also, obvious spoiler warnings (from both the books written by George R.R Martin and the show) are below, but if you're looking into putting some money down on the outcome of this bet we're guessing that you want to be up to date on all the GoT content out there. Bran seems to be the front-runner on many sites but I'm not convinced. Sure the kid might be one of the most powerful people in Westeros but as the successor to the Three-Eyed Raven he has stated that his birthright is now irrelevent and he isn't Lord Stark anymore, which probably means he has no inclination to be King Stark either. However, there is a fan theory kicking around that Bran might actually be the Night King (through time travel, warging or a combination of the two) which would certainly be an interesting twist. Jon seems to be having everything fall into place right now: he rose from the dead, reconquered Winterfell, has the support of many of the most powerful families in the Seven Kingdoms, is knocking boots with Daenarys and now apparently there is proof that he is the son of Prince Rhaegar Targaryen. There are signs of trouble on the horizon - besides the threat of the White Walkers - including the fact that Daenarys is his aunt. Which means what they did is kind of icky and also as the oldest living child of the previous king she might still have the more legitimate claim to the throne depending on views of inheritance. Already a Queen in Essos, Dany's been making major moves for the throne she sees as her birthright ever since we saw her back in Season 1. The show and books have embraced the role of powerful women from Arya to Catelyn, Margaery, Olenna Tyrell, Yara Greyjoy and even Cersei (who might not be the nicest character around but she's sure done her share of winning). So it would make alot of sense for a woman to sit on the Throne at the end. Out of all the characters on the show, besides perhaps Cersei, Daenarys wants the throne the most. But other characters seem to have reservations, Tyrion has futily advised her to exercise more mercy than her hated father the Mad King and others have pointed out that she seems to be a better conquerer than ruler. She will no doubt play a crucial role in the war against the White Walkers but she might not be the best candidate to lead Westeros after. For those who like to root for the bad guys this would be a great choice. A fitting end to this series would be seeing Westeros wiped out because the Seven Kingdoms spend too much time and resources bickering and waging war with each other, instead of the true threat in the North. 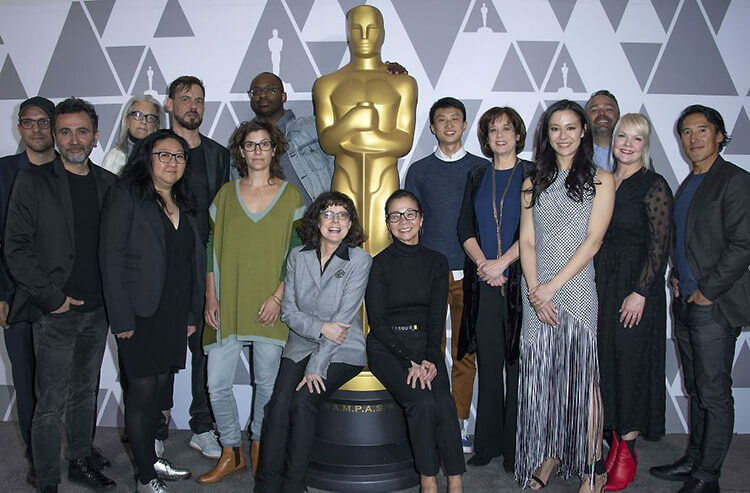 And if Martin really wanted to subvert expectations and go for an unhappy ending this would take the cake. That being said I wouldn't put too much stock in this actually happening, Martin has told fans to expect a "bittersweet" ending to the series, and the White Walkers winning in the end would just be bitter. Don't forget that Jaime already sat on the Iron Throne -albeit briefly - after stabbing King Aerys in the back before the series even started. Martin loves reversing expectations, and having one of the most pragmatic - and now strangely likeable - characters in the series rule Westeros after starting the series off as a king-slayer and attempted child-murderer would be pretty fitting. And yes, if you like crazy internet theories based on hints in the books, there is one that thinks that Jaime (and Cersei his twin) might actually be the children of Aerys Targaryen - although that hasn't even been hinted at on the show. As for what I think will happen? Personally I don't think any one character will rule Westeros, either sitting on the Iron Throne or not. But that doesn't seem to be an option here and if I had to root for one character to rule at the end it would probably be Gendry. The son of Robert Baratheon is brave, hard-working, compassionate and actually knows what living like a small-folk (the peasants in Westeros) is like. He could actually be one of those rare kings that genuinely cares about the people he rules.